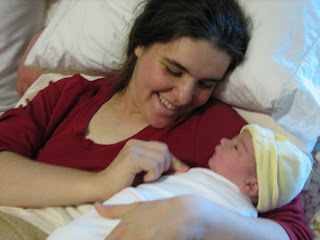 For “K” I’d like to share with you the story of Katie’s birth, that wonderful day 2 years ago when we went from a “couple” to a “family,” and I became a mother! 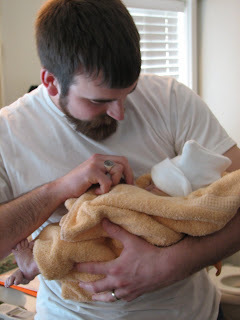 I knew even before we were married that I wanted to have my babies at home if possible. I was blessed to grow up knowing several home-birthing mamas, (including my own dear mother!) and I always knew I would be most happy and comfortable laboring at home, avoiding any unnecessary interventions, assisted by people I actually knew and liked, and snuggling with my brand new baby in my own bed. We knew who we wanted as a midwife before we were married, so when we learned (to our great delight!) that we were pregnant shortly after our first anniversary, we were all set to go! My pregnancy was beautifully uncomplicated, with hardly even a touch of morning sickness. The 40 weeks dragged by as we eagerly anticipated the arrival of our little one, and my estimated due date of March 23rd, 2009, passed uneventfully. I think we took a walk every evening after that. By Saturday, (the 28th, 6 days after the “due” date,) the baby was so well “engaged” that I could barely walk or sit! I felt like my monstrous belly was between my knees! My brothers- and sister-in-law came over to hang out that evening, and Beka swears it was her hilarious story that she read to me that got the contractions going! Later after they went home, I started feeling crampy. I’d been pretty regularly afflicted with trapped air bubbles during the latter part of my pregnancy, and it took quite a while before I realized this was not air…for one, the pain was all in my back, and then, it wasn’t constant. They weren’t at all what I expected contractions to feel like, though. Not a single twinge in my belly area, but completely in my back. So I tried not to get too excited, but told John that I was pretty sure these were contractions! About a half hour later, I started to have some “show,” and I finally allowed myself to feel excited! John decided he should get some rest before things got intense, so we both tried to sleep. John succeeded. I failed. It was very uncomfortable to lie down, so I went to the living room and sat in the big armchair. The contractions were about every 5-7 minutes, lasting for about 45 seconds and kept that up through the rest of the night. I just sat and rocked in the armchair and got a hot-pack for my back. By 7:30, John was awake again, and we agreed that it was definitely happening, so we called Carol. I hadn’t eaten anything since lunch on Saturday, so they encouraged me to eat something…I ate a banana and proceeded to throw it all up during the next few contractions. Ew. Janean rubbed/put counter-pressure on my back during a contraction once and that helped a lot, so after that Janean, my mama-in-law, (who’d come about the same time as the midwife,) and John took turns helping my back during each contraction. Carol took a nap at our encouragement in the “nursery,” since she really hadn’t gotten any sleep to speak of over the past day or so. I lay on the couch in between each contraction, and then would get down on my hands and knees during, as that position seemed to help with the intensity on my back. This was an exciting reminder of where we were about to be: holding our little one at last! It seemed to take an eternity to get our big soak-tub filled up, but once I got in, I had almost instant relief, and everything was much more manageable again! For the next 3 hours, John sat up on the edge of the tub to help my back during each contraction. In between, I would lean back and rest on him..
After a few pushes, Carol told me to see if I could feel the head. And I could! It was so amazing to already have my baby so close to being in my arms…and I knew now that my baby had hair. A lot of dark hair! 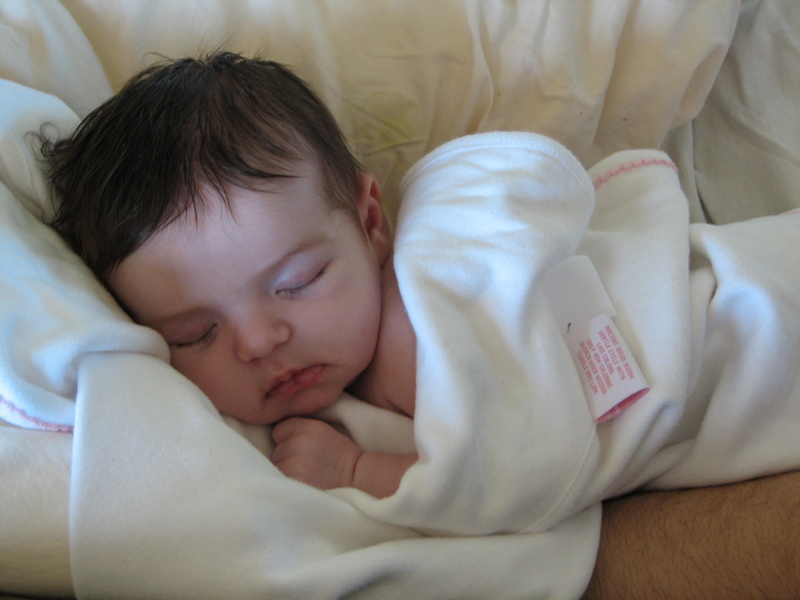 I was suddenly inspired anew, and about 15 minutes later, she was born in the water into my own hands, and I was the first to know that “Baby” was a girl, our beautiful Kathryn Elizabeth. Besides John, Carol and Janean, both grandmas and three aunts were in the room when she was born and there were quite a few happy tears and lots of excitement. And about 3 bajillion photos. The whole labor from the very first contraction to baby-in-my-arms was about 15 hours, not bad at all for a first-timer, and not a single hitch or complication, with only a tear so minuscule it didn’t even require a stitch. I remember saying, shortly after I got out of the tub, “I could totally do that again!” And I could. And I have. Although, after #2 (which you’ll get if when I ever get to “V” for Victoria’s birth story,) I felt considerably less…jovial. I loved homebirth and the water labor and delivery, and can highly recommend it to everyone that has that option available! …with a head full of hair! We love our little girl and can’t imagine life with out her! Thanks for sharing – very sweet story that somehow I've missed hearing until now. You tell it so well – everything a woman likes to hear, without out *too* many gory details. You certainly have two of the most beautiful daughters I've ever seen. I simply love the first picture of you in the post with your fresh little blue baby! You are a beautiful and talented mama – keep up the good work! What a wonderful birth story! Love the photos. I wish I'd had the knowledge and support you did for my first two. Tot his day it bothers me that I was THE LAST to know the gender of my kids. Literally EVERYone in the room, including strangers, knew before me. Thanks for sharing!! I enjoyed reading it! oh my goodness, she is adorable! What a wonderful experience! This is such a wonderful story! Thank you for sharing it! I'm finally stopping by and returning the visit from FormulaMom! Thanks for stopping by! I'm a new follower! Wow so much hair. she is beautifuk. I am stopping by from the Alexa Hop. Here you can find my story. What a wonderful birth story!! I love reading it, and I hope you get to V because I can't wait to hear your other one! Awwww! I love reading birth stories!! Thanks for sharing yours! Your daughter is and was such a beautiful baby!!! Amazing how fast it all goes though huh?? That is so sweet! Makes me remember when mine were born. Dropping by from Makobi Scribe's Alexa Hop. My name is Katie short for Kathryn too! I so enjoy reading your posts every week! Awwww, what a beautiful story! That IS a lot of hair. I'm not brave enough for a home birth but I can imagine it's better to have family and friends around. With this last one, I felt the contractions I had (only braxton hicks as I had a c-section) almost entirely in my back and he was much lower so I think that has something to do with it. Stopping by from Alexa Hop. I now follow. So glad that you had such a wonderful experience with home birth. Thank you for sharing your story. beautiful story. thanks for sharing. I love the labor present. I don't have that one.. now I want it too. What a sweet, touching story. 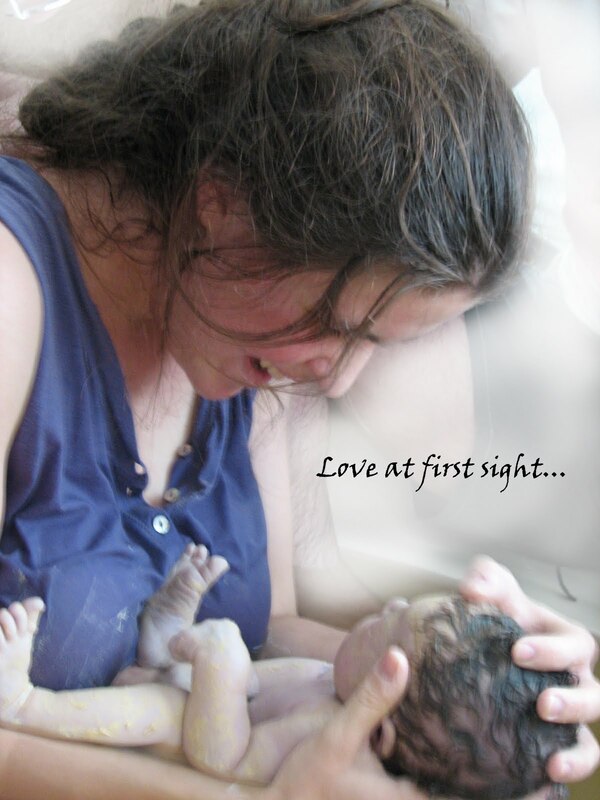 I love birth stories (especially home births) Your story was beautiful! And your pictures of her are just so sweet! What a lovely story the way you told it and that last pic – gorgeous! Enjoy, it flies so fast i want to stop time over here! What a beautiful story! Thank you for sharing. I was actually just asked this past week to be present at a friends homebirth/waterbirth in July – so neat to read about someones experience! That is such a beautiful story. I love reading/watching birth stories. 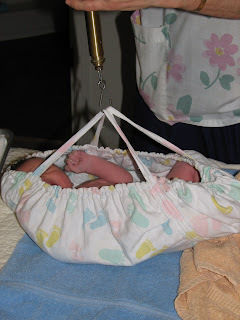 I have never had a home/water birth, but I'd love to. I have no idea how to go about doing it, how much it would cost, if I'd even have that option or not. You gave birth to a very beautiful baby girl! Thanks For sharing this inspirational birthing story. I am pregnant and expecting my first in Aug. I too am doing a home birth/ water labor. This story was really encouraging to a mommy-to-be. Beautiful birth story!! 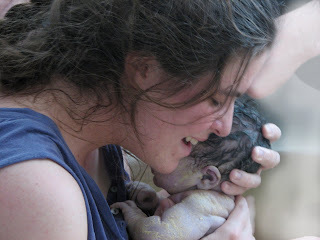 Isn't homebirth wonderful?? I had my first in a hospital but have had two unassisted homebirths since and there is just no comparison. I never want to leave the comforts of home (to birth) again! What a great first birth story. Loved it. I remember my own so well while reading yours. You are braver than I. I had a midwife too, at a birth center across the street from the hospital. It was nice to be heading home though 3 hours after my Princess was born. Thanks for sharing the story and the pics. So beautiful! OMGosh I LOVE this story! I want this so so bad, but I am so scared. Previous post: Chicken Devan – A Great Freezer Meal!